Get hands on with history at Stonehenge and help to move a 4-ton stone, similar to those used to build the stone circle. Using a hand-built sledge, and under expert supervision, visitors can experience for themselves just what it might have felt like to be involved in building Stonehenge. The experiment will run twice a day and lasts for approximately 45 minutes. It involves pulling the 4-ton stone on a hand-built sledge across a range of surfaces and around some obstacles to understand whether rollers, halved timbers or grass provides the most efficient surface and whether a sledge allows greater control of the stone. On the final day of the experiment, Tuesday 16th April, English Heritage will attempt to move and then raise the stone into an upright position using an a-frame (and a lot of muscle power)! All visitors are welcome to join in however, it is not recommended for people with back, arm, shoulder or knee injuries or pregnant women. Children must be supervised at all times by an adult. English Heritage is hosting a full programme of events over the Easter holidays, giving visitors the opportunity to explore an element of prehistory that most interests them. The events are designed for all ages and reveal that our prehistoric ancestors were organised and skilled craftsman, using sophisticated techniques to craft natural materials and fibres into tools and essential everyday items, as well as luxury objects such as jewellery and grave goods. 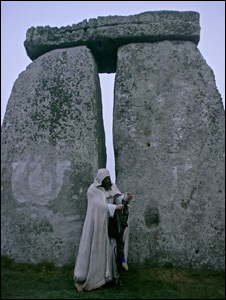 Reblogged this on Stonehenge and Salisbury Guided Tours.